In this guide you'll find details explaining exactly how to start or activate the Heroic version of each of Destiny 2's Public Events. As you may know, Heroic Events are a higher tiered version of regular Patrol Events, that can be found evenly distributed across each of the patrol zones of Destiny 2. As the name implies, the Heroic version of an event is considerably more difficult compared it's regular counterpart. Rewards are typically better, XP gains higher and you'll probably earn far more Legendary engrams in the process. 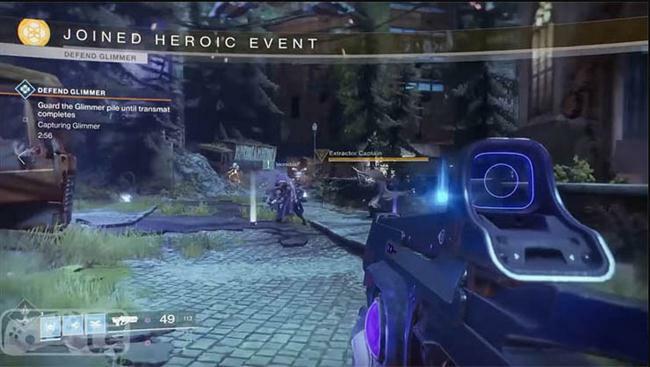 Players will know they have triggered this superior difficulty simply by the "Joined Heroic Event" text appearing at the top of the screen. Destiny 1 contained a fair selection of public events that spanned from Earth to Venus, and with the launch of Destiny 2, Bungie have added an even greater number and variety of events to inhabit the new patrol zones of EDZ, Nessus, IO and Titan. Events no longer follow the rigid timer basis as they did in Destiny 1. 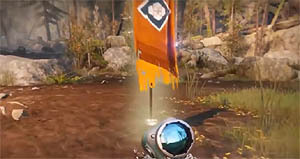 Instead, players can instantly view the countdown timer for each event on the map screen, and even start the event manually by interacting with the Flag at the Public Events location, known as "Rally to the Flag"
Unlike in the original game, players can no longer "lose" a Public Event in D2. Whether you complete the objective or not, you'll still earn some rewards for your participation and effort. Public Events typically reward: a weapon or armour piece, and a planetary "Token" e.g. EDZ Token. The Public Event icon in D2 is a BLUE diamond. Hovering over the icon shows: the map location e.g. Winding Cove, European Dead Zone; a countdown timer; and right at the bottom, the potential rewards e.g. Rare Gear. Lastly, activating an event will instantly fill your entire Super meter to max, readying you for the task ahead. Cabal Excavation is a classic event that returns from Destiny 1 but with some slight variances in D2. 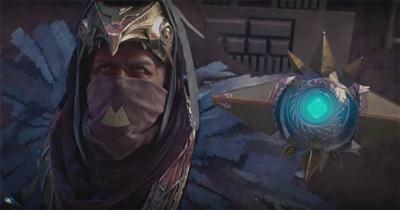 For the heroic version, look out for the Thresher dropship that periodically arrives to drop enemy Cabal into the area. See image above. Destroy this ship with all your firepower to start the Heroic version, whereupon, the objective changes to "Defeat Excavation Valus" and players must kill the yellow bar enemy to complete the challenge. The Glimmer Extraction event consists of several waves of defeating Fallen enemies. Players move from extraction site to extraction site, signalled by the prompt text: "Find the next extraction site" at the top of the screen. The key to starting the Heroic version is to take note of the three generators on the floor at extraction sites (see image above). Destroy each of these generators quickly to activate the mode, whereby the event changes to "Defend Glimmer" and tonnes of glimmer falls onto the floor. Stand within the white circular glimmer "zones" and fend off the Fallen Captains and other Fallen enemies for a couple of minutes to succeed. Destroy the Servitor to cut off the Fallen Ether supply. Probably the easiest Heroic event to trigger. Take note of the three smaller Servitors (robot balls) with the name Transport Servitor and the giant Servitor in the middle. From time to time, the three smaller ones will tether to the giant ball, turning it immune. Rather than focus on the giant Servitor, simply kill the three smaller Transport Servitors first and you'll trigger the Heroic version immediately. The Heroic mode is exactly the same as the normal event and it's one of the easiest events to complete for Bright Engrams. One of the new public events for Destiny 2, the Injector Rig comprises of a giant structure with a heat shield that activates from time to time. Whilst active, players suffer damage inside the heat shield but this is crucial for activating the Heroic version. Wait for the machine to overheat, then step into the shield and take note of the bright heat vents on the sides.One of these vents is shown in the image above. If possible, split your firepower and restbites between team members to stay alive, as you destroy all of the vents to activate the Heroic mode. Defeat the Arsenal Walker protecting the caches. The classic Spider Tank event returns in Destiny 2 with a slight twist. The first walker dropped into the event will attempt to protect the weapon caches, shielded by blue bubbles. You can either choose to destroy the Walker, or use its charges to free the Scorch Cannon's inside the caches. For this event, you must capture each of the three smaller pillars that are powering the central hub. Each pillar has a beam of light shining into the middle. Simply stand beside each pillar until they are all activated. This is fairly similar to the VoG raid where players activated pillars to open the main door into the vault. The Heroic version changes the event name to "Hold Off Vex Elite" and the Integration Mind (Hydra) enemies must be defeated to succeed. This Taken Public Event consists of a large Blight (orb) surrounded by three smaller Blights. Entering the area of a smaller Blight gives you a buff called "Blight Receding". When the buff is active, attack the large Blight until enough damage is done that the event turns Heoric. It's that simple. The Heroic version changes the event name to "Defeat the Blightmaker". 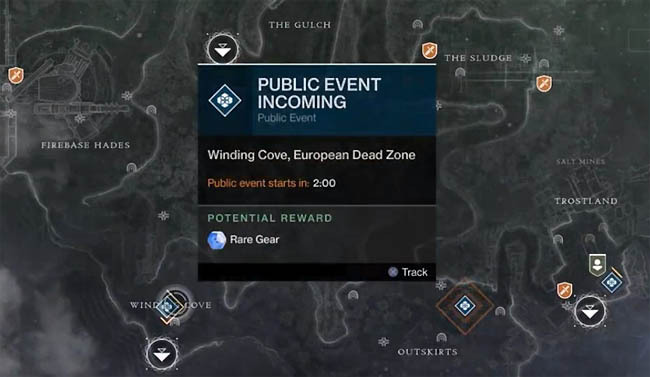 A Hive public event which is probably one of the easier events to switch over to heroic. The event starts with two witches. Kill those two swiftly and two purple coloured crystals will appear on either side of the large portal, up above (see image). Now stand within the hex circles on the floor, aim at the crystals and destroy them. Once destroyed the event description changes to "Defeat the Abyssal Champion" and a giant knight spawns into the event.